Beaverton Beaver Removal needs to be solved by a professional wildlife control company that has years of experience dealing with beavers. 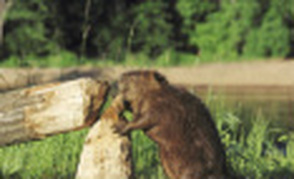 When not done properly controlling a beaver problem can create a risk of harming other animals. We have been dealing with beaver problems for over 30 years and use the knowledge to safely solve problems in rural areas or in cities. Beaver need to be consistently chewing because there teeth never stop growing. That means they are always doing damage and they are always building dams to back up water. The reason they backup water is to flood areas to make larger areas for them to live in. Beaver's can move much quicker in water and feel alot safer in water. So the best solution to solve a beaver problem is to remove them as soon as possible. There are other methods to help control water level, but they require alot of maintenance and are not always effective. Cutting down trees and brush. Bank erosion from beavers digging. Raccoon Skunk Beaver Squirrel Coyote Mole, Gopher, or Vole Rodent Bird Bat Dead Animal Removal Attic Clean Out or Sanitation I have NO idea!! For Beaverton Beaver Removal Call 503-201-2432 Today!